Late November 2014, my mail to Ganesh Nayak elicited the same automated message that had originally prompted this story. I just got back from a mind blowing trip to Muktinath (Annapurna). WOW! It blew my mind! The Himalaya here is so different from what I have been used to in India. The pine forests and snow are so close here. As I made my way towards Muktinath, the environment was very similar to Leh but there was plenty of water from all the icecaps, making human habitation possible. Ladakh in comparison had been sparsely populated. However, both have a charm of their own. I did some initial research before heading in and knowing that there was a ton of cheap teahouses on the way, I went in with a very light weight-setup. I was as light as a cloud and just floated up to 3700m (Muktinath) from 820m (Pokhara). There is no way I am going back to loaded touring after this. I am right now in Thamel and I am heading out in a bit to try and sell as much of my gear as it is possible for me to do. That should add some weight to my depleting kitty. My bike is in need of servicing and I am getting one done today. Anyways, after leaving Ranikhet, it was tough going for a bit. I had been surrounded by people for a while and suddenly I found myself riding alone. That was a bit difficult. But once I entered the Terai of Nepal, I was again surrounded by people all the time. There are as many bicycles there as people and I had people riding by my side throughout the day – from school girls to army men to granddads and grandmas. I am heading back to India after this. I didn’t have a plan as such until a couple of days ago. On a book shelf in Pokhara, I came across Anne Mustoe’s ` Two Wheels in the Dust.’ I am currently reading this book and will probably base my route back to Manipal on this. Earlier this year, when Ganesh Nayak applied for the fall season Wilderness First Responder (WFR) course at the India branch of the National Outdoor Leadership School (NOLS http://www.nols.edu/), the office immediately got a sense of person and predicament. Applications typically entailed a few more instances of correspondence between NOLS India and the applicant, ironing out details. In Ganesh’s case, Ravi Kumar, Director, NOLS India recalled, the office was treated to an automated message informing that he was out on a long trip and would respond as and when he could. In the world of adventure and personal discovery, which is what NOLS is, the required flexibility is extended; not to mention – the erratic correspondence kindles curiosity for the story behind the message. 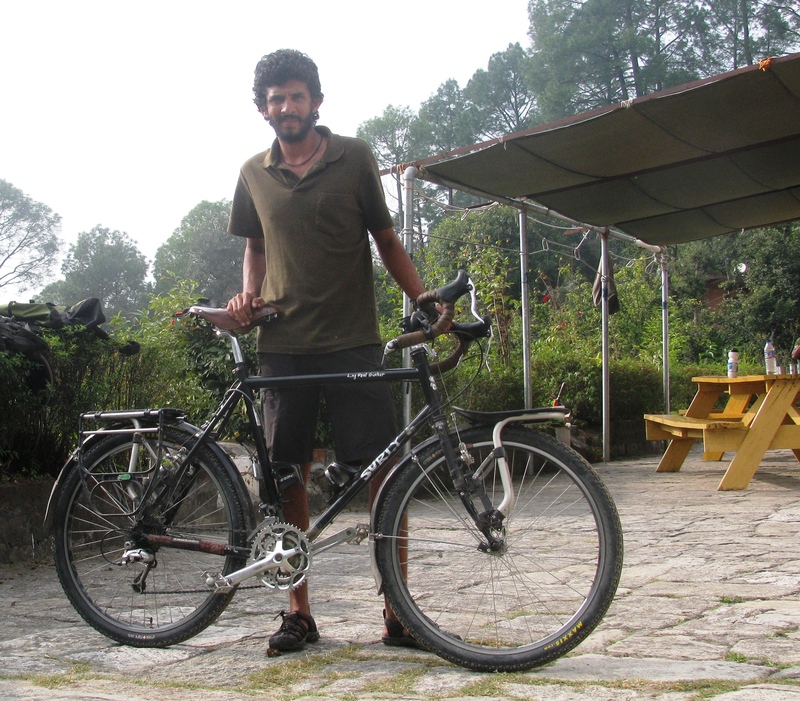 The story reached Ranikhet, in time for the WFR, on a Surly bicycle. It was the classic touring model with black steel frame, Brooks saddle, pannier racks up front and behind, gears and that generally solid appearance designed to crunch months and miles. Ganesh was riding in from Mussoorie. It was almost two months since he had begun his odyssey – a cycle trip along the Himalaya. What made the story particularly engaging for this author, an Instructor-In-Training (IIT) just back at NOLS India from a long hike with the fall semester course and discovering a Surly on the premises were Ganesh’s demeanor and his journey to a dream he never thought existed in his head. Some years ago, Ganesh, now 32, was at a low point in life. Born and brought up in Manipal in southern India, the electronics engineer had taken to drinking and was generally adrift. He knew he had got it all wrong but getting out of the funk required a road map and such maps don’t visit any of us easily. Somewhere in that troubled phase, he purchased an ordinary bicycle. For the next six months, he rode it around; progressively realizing that riding long on a bicycle is what he wanted to do. What happened next may seem mad but Ganesh talked of it in an utterly composed manner. After much research and study, he bought his first geared bicycle – the Surly. It cost him over 100,000 rupees. That is expensive by Indian standards but it is not a very significant amount in these days of rising salaries in urban India and willingness among young Indians to put money behind their dreams as people in other countries have done for long. Instead, what struck home as really significant was Ganesh’s decisiveness. He felt confident of vaulting straight from six months with a modest, regular bicycle to an iconic make because he concluded that the dream evolving upstairs in his head could settle for nothing less. Surly it had to be. After buying the new cycle in Bangalore, Ganesh interned briefly with a city based-cycling outfit, at that time called, Cyclists For Life. He learnt how to repair and maintain his bicycle. Ganesh’s first test with the Surly was a trip of around 250 kilometers in his home state, Karnataka. He started at Manipal; proceeded to Agumbe, a place identified with rain forests and much remembered as a protected sanctuary for the King Cobra, then cycled north from there before turning south towards Kollur and Manipal. By now feeling ready for his first long trip, he cut lose to earn the needed freedom – he resigned his job. Earlier this year, he began his journey at Srinagar in the North Indian state of Jammu & Kashmir (J&K). Since then he had cycled through J&K (including much time in Ladakh), Himachal Pradesh and parts of Uttarakhand to reach Ranikhet. “ I had heard of the WFR from another cyclist who did it earlier. That’s how I decided to enrol. I also knew that I would bump into more people given to adventure and travel if I attended the course. That was an added attraction,’’ Ganesh said. His batch of students for the WFR turned out to be a diverse mix, drawn from India, Indonesia, Malaysia, USA, UK and Canada. First aid course done, Ganesh planned to briefly hike in the Gangotri area with some of his course mates, return to Ranikhet and recommence his journey, cycling on to Nepal, Sikkim and Bhutan. While North East India was originally part of his itinerary, Ganesh felt that by the time he completed the current leg of his trip, his resources may be stretched. He may have to return to Manipal to piece together funds for the remaining part of the journey. Reality bites, dreams notwithstanding. Ganesh’s trip engaged for yet another reason. His daily cycling route in the Himalaya hadn’t been held to ransom by some iron clad objective to cycle along a fixed route chosen in advance. He wasn’t out to prove anything. There wasn’t a goal beyond question or negotiation. He allowed himself to be led by conversation with local people and developments along the way. Thus, in Ladakh, he and another cyclist from Chennai opted off the regular cycling route and tagged along with an enterprising horseman to do a largely off-road section, lasting several days. Ganesh liked this excursion and other similar ones availed along the way, immensely. This angle made his trip more organic and less of an imposition in search of achievement. In the process, he discovered differences between the people of the plains and those from the mountains; in particular – glimpses of that fabled simplicity, sincerity and spirit of sharing associated with residents of the Himalaya. “ Even my Hindi has improved,’’ he said, recalling conversations sustained for long and time spent living with local people. Both in the Himalaya and in other places that he cycled through in South India, he had instances of being helped and saved from getting lost by people he met on the way. As he spoke, one sensed a bit of the magic he had experienced since buying a cycle, months ago in the depths of a funk. “ I now feel more connected to life,’’ Ganesh said. Several days later, I was in Ranikhet preparing to head out on a trek, when a familiar rider on familiar black touring cycle slowly drifted down the road to Khairna. We exchanged pleasantries. Back from his trip to Gangotri side, returned to saddle and minus his beard and moustache, Ganesh was pedalling off to Nepal. Ahead lay Pokhara, Muktinath and the automated message I got before his eventual update.